Prasad Hattikudur came to the UK from the fiercely competitive financial services industry in Mumbai, India, determined to further his career. He started an MBA at Aston Business School—ranked fifth in the UK in the Eduniversal Best Masters Ranking 2017—excited to live on campus and pursue post-graduate business education abroad. To his delight, after completing his MBA, he landed a job at Deutsche Bank in London within three months of graduation, aided by the school’s careers team. He’s since worked at the bank for six years and was recently promoted to vice president where he’s finding his MBA skills are more useful than ever. For Prasad, the Aston MBA was a truly transformational experience which helped him hone new skills and succeed in the UK jobs market. 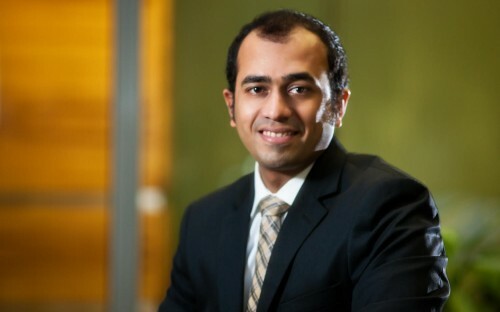 BusinessBecause caught up with Prasad to find out more. How did the job at Deutsche Bank come about? The Aston MBA was key in securing the role. My profile was selected because of my MBA background, which was different from the other candidates who had specific technical degrees. At Aston, we had a dedicated careers counsellor, who provided us with tools to understand the UK job market and prepared us for job applications throughout the course. We had mock interviews and alumni and guest lecturers on campus giving us opportunity to network and build our brand. Aston also joined up with other business schools to conduct a careers fair giving us opportunity to interact with industry representatives. How has your MBA experience helped you develop your career at Deutsche Bank? I believe knowledge, experience and the right attitude helps one succeed in any given role. The one-year MBA at Aston Business School gave me a platform to accelerate my career. It’s helped me expand my knowledge on various elements of the industry including corporate social responsibility, and has given me practical tools that I have been able to use at work. Right from the beginning of the degree, you are put into groups simulating a real team which gave us an opportunity to develop our leadership skills and become better team players. It was an invaluable experience. Why did you decide to pursue an MBA at Aston Business School? I felt growth opportunities at work were limited. The culture amongst my peers in the industry was to jump to a competitor who would pay a few extra thousand, but essentially do a similar role. I did not want to follow the crowd. I wanted to upscale my profile and decided to pursue an MBA. Aston had an edge over my other choices because the school is highly-ranked and holds triple accreditation. What was the highlight of your MBA experience? I had the chance to go for a summer exchange to Hong Kong Polytechnic University where we were taught about the Chinese culture, and how to read and write Mandarin. I enjoy learning new languages but I never imagined I’d have the opportunity to learn Mandarin during my MBA Aston Business School. It was a truly enriching experience! Taking a year off from my career to do my MBA was a great decision. An MBA is an investment; you cannot expect immediate returns. You have to have patience and a willingness to learn and unlearn things. Having a few years of experience is key so that you are able to contribute to the class and be an active participant. You are learning not only through lectures, but also sharing industry experiences and networking with other students. If you are choosing a school, then consider the school’s exposure to industry; access to alumni; the support provided during and after the course; the accreditation; and the rankings. These are generally good indicators of whether the school is right for you or not.